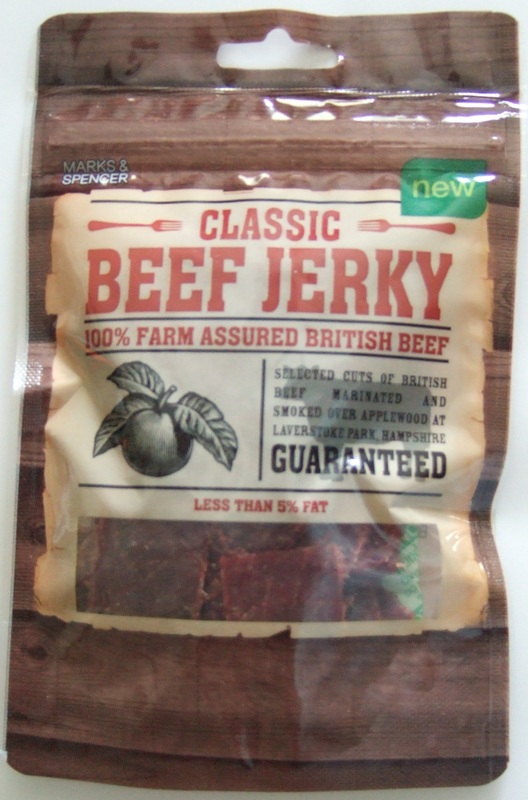 We’re focusing today on the Marks & Spencer Classic Beef Jerky, another of their new jerkies recently introduced in the UK. Taste (B+): Tasty. 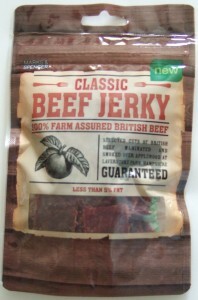 M&S have crafted a simple and enjoyable flavor with this jerky. It is mildly done – sweet, a bit tangy, and smoky in good balance. The flavor is understandably similar to that of its Peppered peer, but the appeal of this jerky is perhaps even a bit better as you work your way through the bag. As an example, there’s no distracting soy sauce taste lingering out of place as the flavors steep in your mouth for a bit, as was the case with the peppered. They’re not trying to take over your taste buds from the first bite here – the goal is overall enjoyment and they’ve achieved that goal well. Texture (B): Job well done: tender, chewable, and generally enjoyable. The jerky is pleasantly pliable and not at all too dry. I like it. Smell (B+): Your nose will enjoy its part in enjoying this jerky. It smells good and does well in setting you up for actual eating. Appearance (A-): This jerky has an appetizing appearance with a dark, meaty texture, and clean cuts throughout. Consistency (B): Bite to bite the flavor was very consistent, but again the actual thickness seemed less so. This is more a point of expectation, to be sure, but while the majority of the pieces’ thicknesses were fantastic the variability seen in these irregularly cut pieces seemed out of place and did distract a bit. For some jerky the variation would be part of the charm, but this isn’t one of those jerkies. Overall Impression (B+): Go on… get some. You’ll like it! M&S have another great jerky on their hands and I can definitely recommend it if you’ve an opportunity to pick up a bag.